Given the increasing number of foreign projects being peddled on our shores over the past year or two, the wife and I have been wanting to write this for awhile now but somehow did not manage to get down to it till today. This is hardly exhaustive rather an accumulation of our experiences and opinions. So feel free to add on to our list in the "comments" section! Alternatively, if you have a specific question on this subject, give us a shout and we be happy to provide you with our two cents. Probably the first thing to decide and be very clear about. Properties in certain cities are better for "keeps" (e.g. Japan) simply because the rental yields are decent but capital appreciation tends to be slower, while others (e.g. 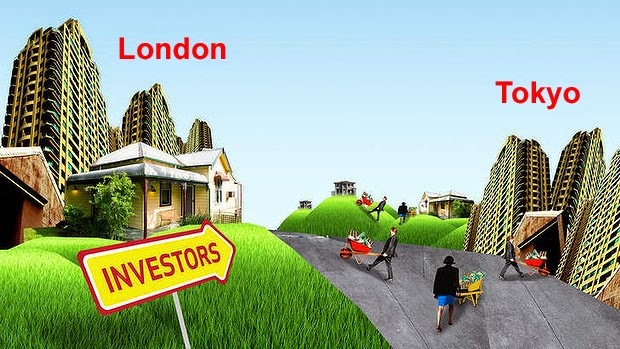 London, to a certain extent) may present better "flipping" opportunities as capital appreciation for some projects can be rather high at relative short holding period. The wife and I always believe in buying into not just major cities (e.g. London vs Strafford, Tokyo vs Fukuoka) BUT more importantly, "good" locations within the city. So when you see an advertisement in the newspaper about a new project in London, for example, the first thing you need to understand is WHERE exactly in London is the project located - a project in Zone 1 is a totally different kettle of fish compared to one located in Zone 5. This is because the "zones" represent concentric rings extending outwards from the London city centre so the higher the zone number, the further away the project is from London city itself. And given the vast geographic nature of London, this is a very important consideration. While an apartment may represent a bigger investment quantum than say, student accommodation, the later may pose a bigger challenge when you try to sell it off in the future. In addition, your pool of tenants is also limited as you can only rent the unit to students. An awareness of possible changes in the social and political situation of the city/country may be more important than you expect. A case in point that happened to the wife and I recently was when we decided to put money in an apartment in Edinburgh a couple of months before the Scotland independence referendum. This event completely eluded us at the time of purchase and you can imagine our anxiety when the referendum happened. "Subsale" in certain countries (e.g. UK) may not be as straight-forward a process as compared to Singapore because of "assignment of rights" issues. And regardless of which foreign country you are buying into, understanding what/how much you need to pay in terms of taxes is essential. This is especially with regard to capital gains tax, which can be quite prohibitive in some countries. When the wife and I recently attended a property road-show for a project in Chicago, we were told that the total cost of holding the property (which included the condo management fee/sinking fund, property tax, tenant management fee charged by the managing agent and homeowner's insurance) will come up to 50% of the gross rental income. And with the mortgage repayment taking up another 50%, one can only expect to breakeven during the period of time that the property is rented out, while waiting for the capital appreciation to kick in! While speaking of loans, not every country/city is equal when comes to mortgage availability from our local banks. While most of our banks will readily extend loans to you for property purchases in "established" countries (e.g. Malaysia, UK), you may have limited options with other countries (e.g. Japan and even United States). And in some case, you may have no choice but resort to taking loans in the country of purchase as none of our local banks offer property loan for that country (e.g. Canada). One should also be aware that interest rates on mortgage loans for foreign properties are generally higher (sometimes much higher) than the ones extended for local property purchases. Banks will extend different maximum loan quantum for different country/city. And sometimes within the same city itself, the maximum loan quantum may also vary depending on the actual location of the project concerned - the wife and I were told that banks may extend a lower quantum for projects outside of zones 1 and 2 in London, for example. The maximum loan quantum will determine how much cash you need to put up for the purchase. 2 comments to ''Things to consider when investing in foreign properties"
Also need to consider your currency exposure in Foreign investment. Hi Anonymous (Oct 12, 3:31pm), thanks for that. A fluctuation of one cent in the foreign currency concerned may mean a difference of thousands of dollars. Here's some clever ideas for more space! The Crest "re-previewing" at lower prices! Marina One Residences not so hot with the public! Condo without parking: Yes or No? Developers turning "edgy" towards new EC sites!